A new website that better visually communicates Nancy’s abilities and more focused service offerings, gave her an opportunity to re-introduce Chi Baby to both new and existing clients. 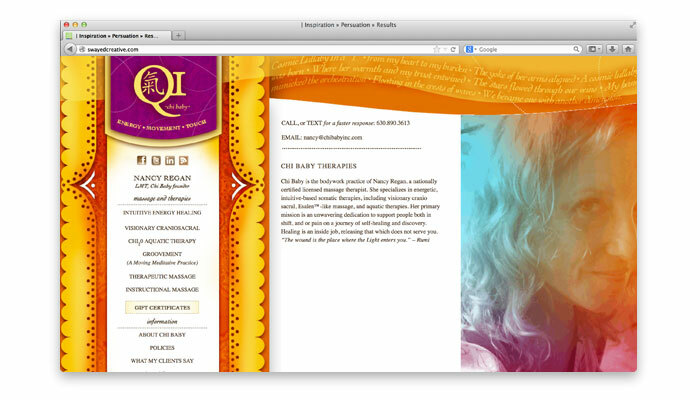 Chi Baby is now benefiting from measurable growth and an expanded and continued loyal client following. If you’re running your business on your own, with a small staff or a limited budget, it’s best to focus on the things you do best and keep building loyalty. Strategically add staff and services to build growth if that’s your goal. – Trying to spin too many plates at once eventually leads to a lot of broken China. Be sure to review your marketing tactics regularly to ensure they reflect your business well. If your website or printed materials are not on strategy, you may not be connecting with your target market. – Be true to your brand. Painting stripes on a horse doesn’t make a zebra.